An adaptation of a DC Comics character, Green Lantern's silver screen outing featured Ryan Reynolds as the eponymous hero who battles the baddies Parallax and Dr Hector Hammond. While the film didn't rake in as much as expected, Reynolds did meet his future wife, Blake Lively, on set, so it wasn’t all bad news. 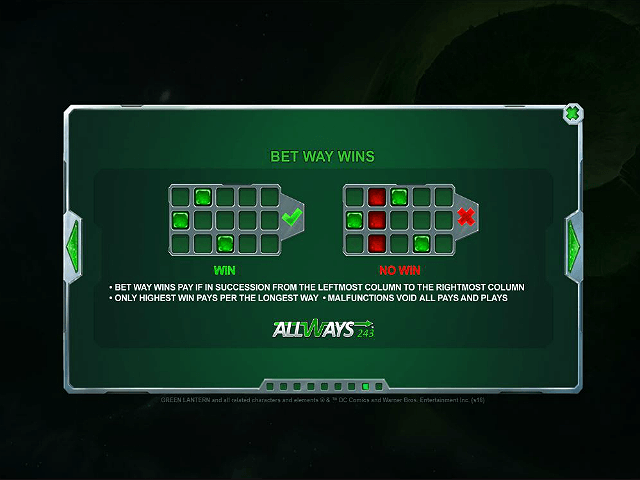 And there's good news for slot gamers, too: this version of the Green Lantern has been created by the iconic Playtech. Think high energy, stacks of bonuses and features, and four different progressive jackpots! Play Green Lantern for Real Money! Playtech have once again rolled out their '243 ways to win technology' here to ensure that each spin of the reels delivers maximum excitement and anticipation. 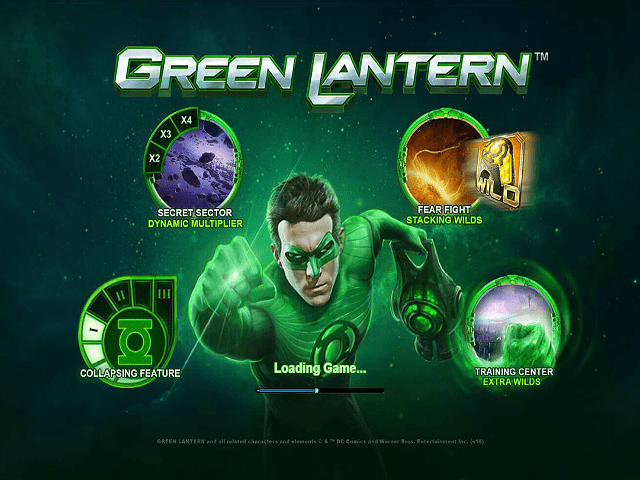 The base game’s main symbols are characters from the Green Lantern series: the title hero, Guardian of Oa, Sinestro, and Tomar-Re and Kilowog. If these names mean nothing to you then worry not – simply consult the paytable for more details. A smooth touch from Playtech comes in the form of their collapsing symbols feature. This is simple enough to follow: in every winning combination, the relevant symbols disappear, and are replaced by new ones from above, creating potential new wins. This feature can have a spectacular effect on your bankroll if a winning chain is achieved. Each win adds more energy to the power bar, and, if you can fill up the four bars with the same number of consecutive wins, then one of three bonus features is awarded. 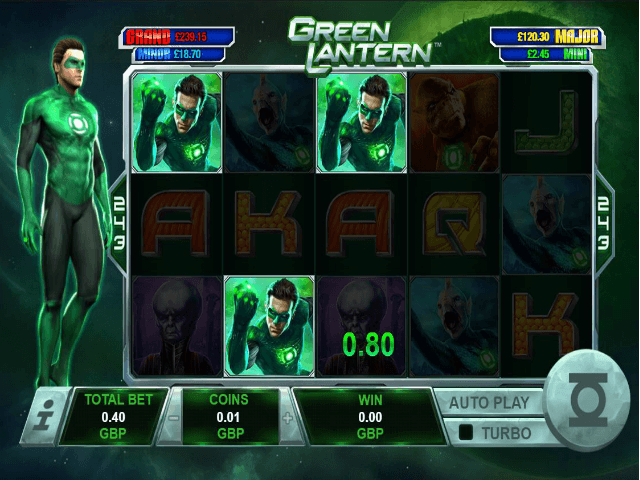 The trio of special features in the Green Lantern jackpot slot each serves up its own unique gameplay. The Fear Fight Mission explodes all of the winning symbols from the main game and replaces them with standard or stacked wilds for the duration of the feature. An unlimited number of free spins play out until the reels are covered with stacking wilds. The Training Centre Mission is a standard free spins round, with ten freebies awarded. Extra wilds are added to your reels for good measure. Finally, watch out for the Secret Sector Mission, which also rewards players with ten free spins and dynamic multipliers a-plenty. Each time a winning ‘collapse’ occurs the multiplier increases by 1x – a maximum of 9x is achievable here. 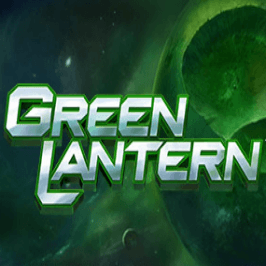 Here’s the real treat of Green Lantern: players have a total of four progressive jackpots available to win! 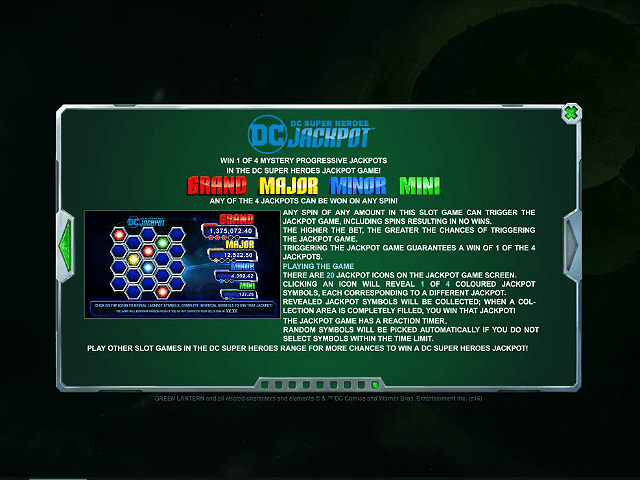 This is because Green Lantern slot is part of the DC Comics progressive network, into which all relevant slot games including Ghost Rider and Superman II feed into. You'll find the jackpot amount regularly exceeds the £1 million mark. The four jackpots are named Grand, Major, Minor and Mini, and are randomly triggered so that players of all budgets have a chance of landing a life-changing sum of money. You can even trigger a progressive jackpot on a losing spin! Mini, the smallest jackpot, has two blank slots, Minor has three, Major four and Grand five. Share this Green Lantern Review today! If you like Green Lantern, you'll love these slot titles too!